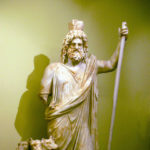 Perseus is one of the most famous heroes of Greek myth. 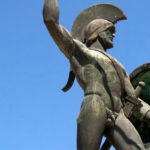 The character is one of the many ‘local heroes’ of Greece, tied specifically to Argos. 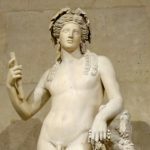 Perseus’ character isn’t quite as violent or complex as those you might see in other myths, but he’s interesting nonetheless. 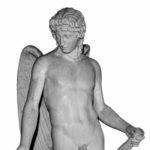 Perseus’ myths are also full of gods, creatures, and monsters that you might see in a number of Hollywood movies and television shows. 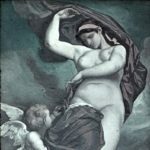 Even if Perseus’ myth is a little on the simple side, it has still had a huge impact on Greek mythology. 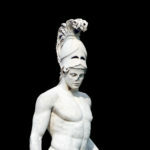 Like most Greek heroes, Perseus is part divine (god) and part human royalty. In this case, he is the grandson of a Greek king named Arcisius. Acisius wondered if he would ever have any children, so he consulted an oracle (a person who could tell the future) to find out the answer. He was told that not only would he have a daughter, but that his daughter would someday have a son who would wind up killing him. Perhaps naturally, this scared Arcisius. He didn’t just become afraid, though – he became dangerously paranoid. Instead of facing the prophecy, he went a little mad once he actually had a daughter. He had the girl, who was named Danae, locked into an underground jail that was lined with brass walls. This jail was meant to keep out any man who would ever find her and allow her to give birth to a son. Unfortunately, Arcisius (like far too many Greek fathers) forgot that he didn’t only have to worry about human men. Indeed, he should have been worrying about a god. Zeus was the king of the Greek gods, and he was particularly interested in beautiful (and royal) human women. 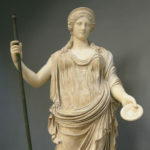 Danae was a particularly beautiful girl, and this meant that Zeus just had to have her. 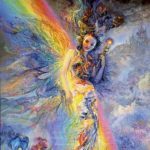 Not one to let a little thing like an underground prison hold him, Zeus transformed himself into golden rain and snuck into the cave in which Danae lived. 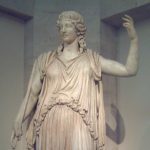 As such things tended to go in Greek mythology, Danae gave birth to a son a few months later. To her credit, she did a fantastic job of keeping the boy a secret and no one actually knew that Zeus was the father of her child. As you might expect, though, babies aren’t easy to hide when you live in an underground prison. 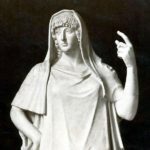 Like most fathers, Arcisius didn’t really buy the story that Zeus was the father, and he instead assumed that Danae’s nurse had helped his daughter to meet a man and held her responsible. He had the nurse put to death, and gave serious consideration to killing his grandson. Fortunately, a number of factors (including his own guilt) stopped him from directly harming the baby. Instead, he decided to send the boy and his mother away so that the prophecy couldn’t come true. He had a special ark built, put his daughter and grandson inside, and then put them out to sea. It was a solution that would keep him from having blood on his hands, but would still keep the prophecy from coming true. As one might expect, the trip isn’t easy on either the mother or the baby. The ark drifts for a few days, until it washes up on the Greek island of Seriphos. On Seriphos, the ark is found by a kindly fisherman by the name of Dictes. DIctes wasn’t just any fisherman, though – he was the brother of the island’s ruler, Polydectes. The fisherman took in both the mother and the baby, who would be named Perseus. Perseus grew up to be a particularly strong and brave young man, much like Zeus’ other famous sons. His biggest challenge ended up being Polydectes. The island ruler fell in love with his mother, and Perseus was quite protective of Danae. He kept her under guard at all times to keep her away from Polydectes, but the ruler wouldn’t be denied forever. He wouldn’t fight Perseus, but he’d find a way to get to Danae nonetheless. Polydectes actually had a fairly cunning plan to get rid of Perseus and get to Danae. He threw an elaborate dinner party, and invited many friends. Polydectes asked a hypothetical question – what gift would each guest bring, if they actually had to bring one? 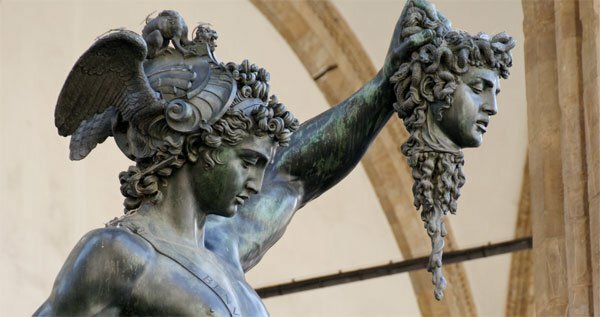 Perseus, being young and foolish, answered that he’d bring Polydectes the head of Medusa. 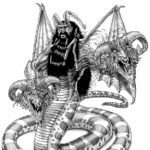 Medusa was a Gorgon, a frightening monster who had the ability to turn men to stone if they stared her directly in the eyes. 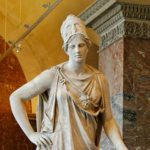 Realizing that Perseus was foolish enough to follow through with the boast, Polydectes called him on it – and said that if Perseus didn’t bring him the head of Medusa, he’d take Danae as a consolation prize. It was a sure-fire way to get rid of the overprotective young man and to leave Polydectes alone with his object of affection. Perseus set out to get Medusa’s head, determined to keep up his end of the bargain and to keep his mother safe. Since he was the son of Zeus, though, he wouldn’t be alone. 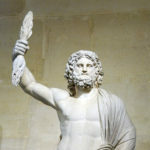 While Zeus had no particular involvement in Perseus’ life, it didn’t mean that the gods weren’t aware of the young man. 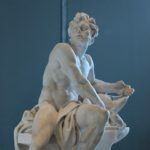 The Greek gods loved to get involved with quests, and thus they’d give Perseus a few tools that would help him to complete his task. 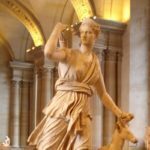 Perseus was aided in his quest by two gods, Athena and Hermes. He was intelligent enough on his own, but the gods decided to even the playing field a bit with some gifts. He was given a pair of winged sandals, which would allow him to fly. He was given the helmet of Hades, which would render him invisible, and a shiny shield. Last, but possibly not least, was a special bag that would allow him to hold the head of the monster should he be successful. These gifts would give him the edge he needed to defeat a monster who had been cursed by the gods for her vanity. Perseus made his way to Medusa with the gifts, putting into play a fairly cunning plan. He would fly above Medusa, looking at her only through the reflection in the mirrored shield given to him by Athena. She’d never be able to track him, thanks to the invisibility bestowed by the helmet. With those advantages, he was able to make short work for the Medusa and place her head in the bag. Perseus fulfilled his vow to Polydectes, defeated a monster, and managed to get away without any harm to himself. As is incredibly common in these tales, he also managed to meet a woman on the way home. This time, the woman’s name was Andromeda and she was set to be sacrificed to a sea monster. Thanks to all of his gifts, though, he was able to defeat the monster and rescue the woman. All would have been good, but there was another man involved. This time, it was the uncle of Andromeda herself. 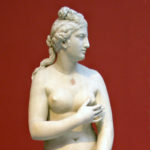 Andromeda’s uncle wanted to marry Andromeda himself, and he didn’t much like the idea of sharing her with anyone else. Fortunately, Perseus and Andromeda were able to hatch a plot to deal with the possessive uncle. 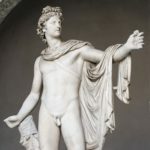 When Andromeda’s uncle looked at Perseus, the hero withdrew Medusa’s head from the bag and turned the other man to home. He repeated this trick when he returned home, saving his mother from the unwanted attention of Polydectes by turning her suitor to stone. The only lose end left in the tale was Arcisius, who had sent his daughter and grandson away to make sure that they wouldn’t fulfill the oracle’s prophecy. 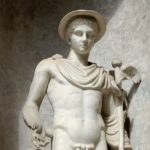 Upon hearing about Perseus’ deeds, Arcisius grew afraid of the man and assumed that Perseus would come to murder him just as he had done to Andromeda’s uncle and Polydectes . He fled far from his own kingdom, hoping to avoid both Perseus’ wrath and the fate that had been laid out for him by the oracle. Arcisius fled to a city named Larissa, where the good king Tentamides had set up a series of sporting events in honor of the gods. 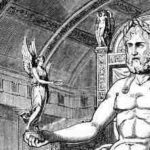 Unbeknownst to the king, Perseus was in attendance – but he had no idea who Arcisius was. Arcisius felt safe enough to watch Perseus compete in the discus event, and that ended up being the king’s downfall. Prophecy, it seemed, could be put off but it could never fully be outrun. 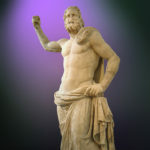 Perseus stepped up to throw his discus, but something went wrong. It slipped out from his hand, flying towards Arcisius. The blow immediately killed the older man, who never got to meet his grandson. When Perseus actually found out what had happened and who Arcisius was, he was filled with grief at what he’d done. Arcisius would be buried with honor, a victim of his grandson just as the prophecy had foretold.